Muscles build exactly the way you train them. Flexibility is not the secret superpower of a few lucky bodies, it is yours to achieve. Any body can become more flexible with the proper techniques and some dedication. If you only build your muscles in a short range of motion, it will be difficult to use them when you want to be bendier. By focusing on strength training in extended, stretched positions we create flexibility you can use for greater freedom of movement. Our flexibility classes are recommended for anyone who requires a greater range of motion for their activity of choice. Our students include dancers, circus performers, pole dancers, martial artists, yogis, skiers, figure skaters, opera singers, crossfitters, power lifters, rock climbers, swimmers, and people who want to be able to put on their socks in the morning without grunting. Fit & Bendy offers the following FaBulous classes at our studio in Los Angeles and other locations around the city. We welcome you to the FaB family. An introduction to the graceful art of contortion, this 90-minute class builds the strength, endurance, and flexibility necessary to start your journey. We build muscle that stabilizes the joints as you increase your range of motion targeting all those areas that are missed in most conventional workouts. After a delicious warm-up we develop active and passive flexibility in the legs, hips, shoulders, and the spine building towards front and side splits and a beautiful backbend. There are no prerequisites for this class but if you have any injuries or health concerns we recommend that you speak to the instructor ahead of time so that they can address any concerns. 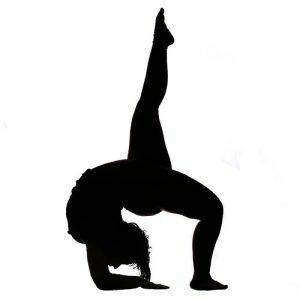 This two-hour class is for the experienced bender who already has a regular flexibility practice and is looking for some expert coaching. Providing all the benefits of personalized coaching in a small group setting, each person works to their own level and is given customized exercises to hone their technique and learn new poses and movements including standing splits, backbends, chest stand, and inversions. The prerequisite for this class is that you have a strong fitness practice and body awareness. Even if you are not super bendy, you must have stretching experience. We do recommend taking some Intro to Contortion classes first to familiarize yourself with our technique. If you are not which class to take, please reach out and we can work with you to get you started. Join some of our favorite powerful, bendy dancers and learn to express your individual flexuality. Flexibility is the freedom to move and this class is all about the joy of movement to music. No dance experience is necessary, just the desire to explore the vocabulary of your body in a non-competitive environment. With a rotating cast of teachers from a wide variety of dance backgrounds you will always get a fresh perspective and some flexy new moves. This is a great class for those new to bending, coming back from injury, or who need a deeper understanding of how to address pain and tightness. This group fitness class uses methods inspired by Physical Therapy to correct body imbalances for more power, flexibility, and pain-free awesomeness. Using precise strengthening, stretching, massage, stability, and balance exercises lead by a Doctor of Physical Therapy student, this class proves that getting fit and bendy doesn’t have to be painful!